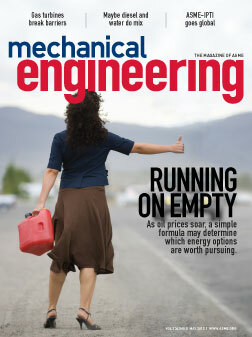 My May column in Mechanical Engineering magazine. Maybe it was meant as an early observance of April Fools’ Day, but a few weeks ago a Dutch filmmaker created quite a stir among those of us who follow the latest technology news when he posted online an amazing video clip of himself soaring like a bird, flapping carbon-reinforced fabric wings strapped to his arms. He complemented the hoax by touting this magnificent feat on a website, along with an equally fabricated set of data. The exploit was splendid indeed—in terms of film illusion—but technologists and others who dream big sulked when they found out the accomplishment wasn’t true. It’s remarkable to see how much we, even as adults, want to believe that anything is possible—Walt Disney must be smiling. Apparently the last few years have taught us that nothing is out of the realm of possibility. Steve Jobs helped make us think differently about how we read a book and a newspaper, how we listen to music and how to conduct business; Mark Zuckerberg showed us a new way to socialize with friends, family, even business associates. More than ever, we’re open-minded about accepting the possibilities of sensational innovations. We want to believe that we can fly like a bird, even when the facts are sketchy; and we believe that robots will be able to feel gentle touches—and now we have hard proof that it could really happen. The point that Bejan and Lorente are making is similar to what author Malcolm Gladwell referred to as “epidemics.” In his popular book, The Tipping Point, published a few years ago, Gladwell described as epidemics the ideas and products and messages and behaviors that spread, just as viruses do. There is a lot to the responsibility of verifying what’s possible and what’s not. The ability to handle the tension between creative thinking and pragmatic development is one of the things that sets engineering and engineers apart. Here’s to the pragmatists, who have the creative foresight to dream the impossible dream.